Category Archives: Alfred Brown (Worsted Mills) Ltd.
Alfred Brown (Worsted Mills) Ltd – weavers of fine quality worsted cloth in Leeds, West Yorkshire. England. 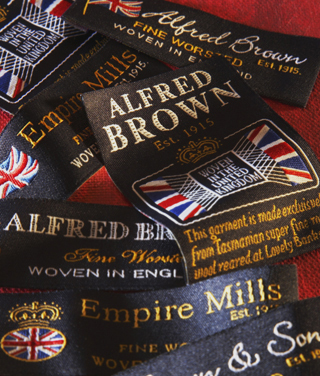 Alfred Brown are weavers of fine quality worsted cloth at Empire Mills in Leeds, West Yorkshire, England. Established in 1915 they are one of the few remaining Yorkshire Mills with bulk production. Alfred Brown weave and supply fabrics for menswear and ladieswear to retailers, tailors and cloth merchants worldwide, in Pure New Wool, Wool with Cashmere, Wool with Mohair, Lycra and Polyester Wool Blends. Here is an article about them in Yorkshire Life. I came across Alfred Brown being used in suiting and blazer material at Fields Menswear. This entry was posted in Alfred Brown (Worsted Mills) Ltd., Clothing and tagged Alfred Brown, Alfred Brown (Worsted Mills) Ltd., Empire Mills, Fields Menswear, Textile Mills, wool on June 30, 2013 by ukmade.